Public radio station WQCS / 88.9 FM is licensed to Indian River State College. At 100,000 watts, the station serves a listening area from northern Palm Beach County to Melbourne. Its format is news / public affairs and classical music programming. It is a member of National Public Radio and Florida Public Broadcasting Service, and affiliated with Public Radio International, American Public Media and the Associated Press. WQCS provides local news and weather information throughout the day and works closely with non-profit organizations to promote their activities through public service announcements, the weekend show "Treasure Coast Happenings" and a weekday "Arts Spotlight" show. A public affairs segment at 5:45 PM deals with people and issues in the communities served by the station. “Floridays” is a special feature each week that offers original voices and stories from the Treasure Coast. To submit public service announcements, please Click Here. News items may be sent to news@wqcs.org. Our main number is 772-465-8989 and our toll-free number is 888-286-8936 and our fax is 772-462-4743. The station also operates the WQCS Radio Reading Service on a closed-circuit sub-carrier. Approximately 500 blind and visually and physically impaired listeners receive the reading service. Each morning, volunteers read local newspapers and other publications. The service requires a special receiver that WQCS provides free of charge. WQCS went on the air in March, 1982 at 3,000 watts of power. It increased its power to 100,000 watts in April, 1986 and moved to its current facility in May, 1993. WQCS is the state-designated Emergency Alert System serving St. Lucie, Martin, Indian River and Okeechobee counties and northern Palm Beach County. Approximately 70% of the station's budget comes from private local support. As a public radio station, WQCS also receives grants from the Corporation for Public Broadcasting and the Florida Department of Education, and support and in-kind services from Indian River College. 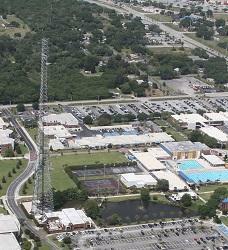 WQCS is located on the Fort Pierce Campus of Indian River State College at 3209 Virginia Avenue. The station is on the southeast corner of the campus, just off South 30th Street. The station is located near the Hallstrom Planetarium and is at the base of the 500 foot radio tower. Our business hours are 8 am to 5 pm weekdays. WQCS provides public service programming that informs, educates and entertains the community. WQCS will offer our audiences the opportunity to access a variety of quality programs through different technologies.